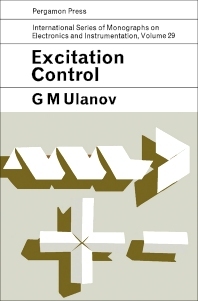 Excitation Control is a translation from the Russian and deals with the principles of control related to the use of excitation as a controlling or regulating effect. This book discusses the research made on different ways to control various objects through automatic regulation, and the laws or principles behind any of these developments. The text focuses on the controls associated with the principle of excitation (invariance) regulation, as well as, the relevant methods and procedures of measurement, transmission or conversion of information in control and regulation systems. The book describes the principal types of automatic control systems and measuring devices that operate on excitation. The author also explains the elements of the theory of automatic control systems that operate on excitation such as the conditions of absolute invariance and the realizability of these conditions. The book then presents examples of calculations concerning combined tracing systems and automatic control systems. This book can prove useful for mathematicians, students, and professor advanced mathematics or physics. Engineers or technicians interested in automatic control and regulation will find this book valuable.